"Protect your home using real Household Sounds (tm)." 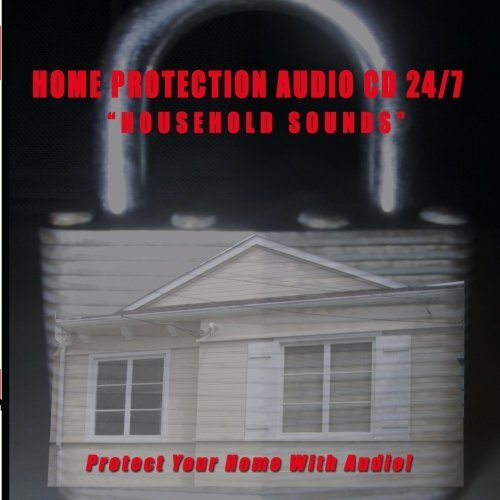 The new Home Protection Audio CD 24/7 protects your home using exclusively "Household Sounds (tm)." The new professionally recorded Household Sounds (tm) give your home the aura of someone in the house. In response to numerous requests for realistic sounds of household activities, your Home Protection Audio CD features a wide variety of digitally mixed Household Sounds (tm) including kitchen, bathroom and living room sounds, cleaning, vacuuming, entry alarms, office sounds, phone machines, printing, and many many more. These sounds have been digitally recorded, engineered and sonically enhanced for maximum realism and audio presence. Add another layer of safety and theft prevention while you are away. Home Protection Audio CD 24/7 uses Household Sounds (tm) to give the impression that your home is occupied any time of day or night. Give the impression that someone is actually present twenty four hours 7 days a week. While a TV or radio does not fool a burglar and may even invite an intruder, the Home Protection Audio CD 24/7 gives the realistic impression that someone is in the house. The Home Protection Audio CD 24/7 is specially engineered with hundreds of convincing sounds of household activities that are professionally recorded and digitally mastered to protect your home. - Perfect gift for the person who travels, an elderly loved one who spends time alone, or for anyone who leaves their home unoccupied during the day.